This high quality double-sided strop has Russian finish leather on one side and fine linen on the other, making it two strops in one. Can be used for sharpening razors. 18" long, 1 3/4" wide. The straight edge razor has long been seen as an icon of its era. It was a time when real men could shave without aloe vera strips, scented shaving lotion, and vibrating handles. Shaving wasn't a chore; it was a ritual, using an heirloom blade that had been passed from your grandfather to your father, and some day on to your own son. The rigid structure of a straight blade provides so much control and accuracy, many barber shops still use them today. 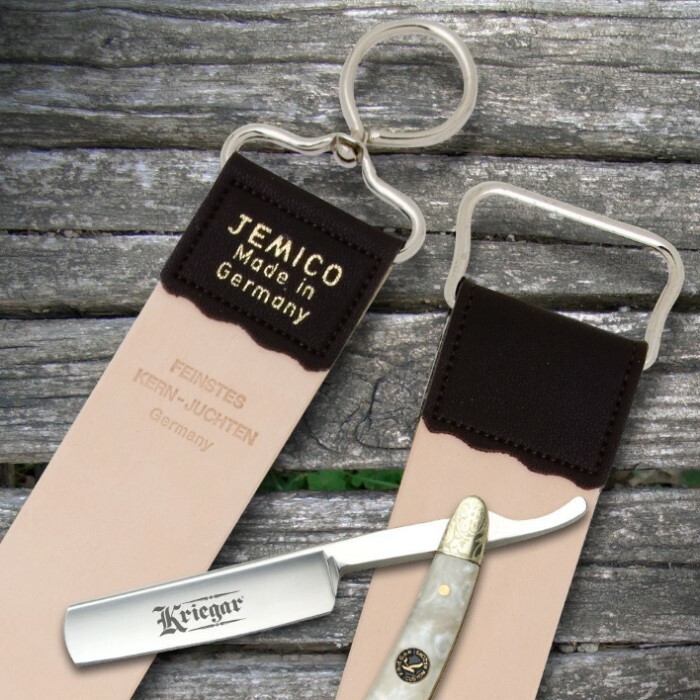 Although the straight edge razor may seem a thing of the past, it has been making a comeback lately, after being shown in movies and plays such as Sweeney Todd. The intimidating appearance of the straight blade, often used as a weapon in movies and theater, is due to it's evolution into what is now known as a switchblade knife. Our straight blades are perfect for any situation from self defense to the best shaving experience of your life. With the proper care, this blade will last forever.